1. Cut the potatoes into small 1"x 1/2 inch pieces. These take the longest to cook, so cutting them small ensures everything cooks evenly. 2. Preheat oven to 375. Spray one large non-stick baking sheet, or two small ones with cooking spray to prevent potatoes from sticking. 3. In a large bowl, combine potatoes, peppers, olive oil, salt, pepper, rosemary, and garlic powder. Mix well to be sure everything is coated with oil and seasoned evenly. Pour onto the baking sheet and place in the center of the oven. Bake for 15 minutes. 4. Use a spoon to toss so nothing sticks or burns. 5. Add the sausage and onions to the baking sheet with the potatoes and peppers and bake, tossing once or twice for 25-35 minutes, or until your potatoes are cooked through. 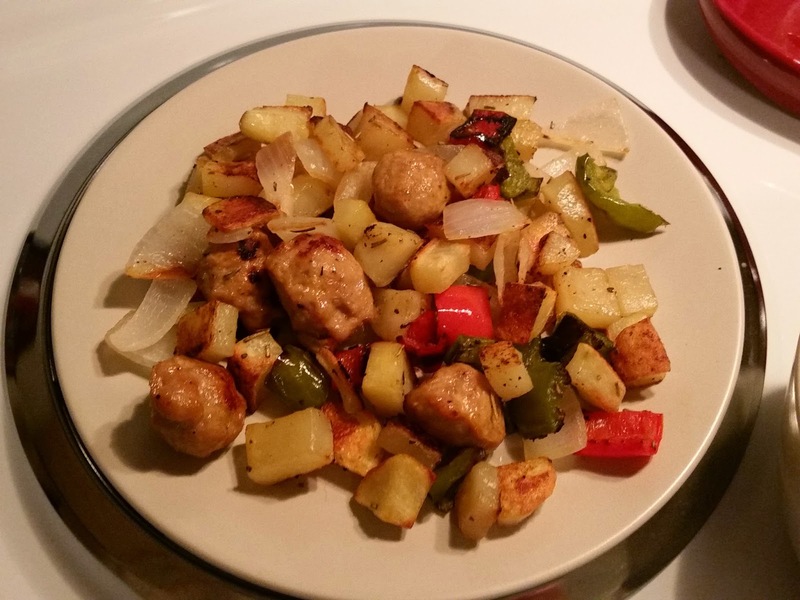 (I did 25) Cooking time will vary depending on thickness of sausage and potatoes. Keep an eye on them so they don't burn. *The recipe calls for two red peppers. As you can see I have some green in the picture. I had an incident with one of my red peppers being molded (thanks Walmart), so I had to make do. No big deal. *Don't crowd the pan. I actually had to use one large baking sheet and then a smaller one. *The original recipe calls for the onions to be mixed in with the potatoes and peppers, but Gina said they get charred that way, and I don't particular care for that, so I waited until I put in the sausage. *I used dry rosemary from my spice rack. Worked just fine. *The original recipe also calls for chicken sausage. However, I had leftover turkey sausage in my freezer, so ta-da! *I paired this with a salad and it was really yummy. Serving Size: 1/4 of total food. :D Haha. I'm not really great at altering either. I kind of was like, oh I like this. But crap. I have this kind of meat to use. Meh. I'll give it a shot. Thankfully it worked. I was always envious of my best friend's mom who could make all kinds of random concoctions from things laying around the house. Looks tasty! I love roasted veg and the mix with the Italian sausage sounds so good. Yum! Good values points wise too. Thanks Trish! I really enjoyed the roasted flavor! I'm really trying to cut out snacking and stick to my WW points. It's been hard though. LOL. I'm kind of salivating right now. I need to make this!!! i love potatoes, haha. Haha! Me too! I love them! When it called for three whole potatoes, I was like heck yes! Nice! Anything with potatoes is a big YES for me, so this one I'd love to try and even more because it's done in the oven! I love your Tasty Tuesdays! :) Yay! This makes me so happy to hear Pili! I love how much feedback I get on these posts! I am all about the oven, since I live in an apartment, so grills are out. I also don't have a crock pot or slow cooker yet! LOL.